5 C 2 3rd fretfr. 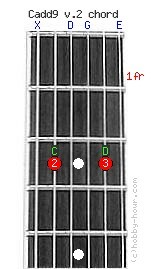 Chord Cadd9 v.2 notes: C, D, G, D and E. You should not play the 6th string. The strings 4(D), 3(G) and 1(E) are left open. The Cadd9 (C major added 9th) guitar chord is sometimes referred to as Cadd2, depending on the position of the added note and often incorrectly noted as C2.